After a strong return, Veep slows down in “Discovery Weekend,” focusing less on re-establishing the show’s trademark rhythms and energy and more on setting up the rest of the season to come. Selina has taken the weekend off of campaigning in Iowa to attend mega-donor Felix Wade’s Discovery Weekend, a retreat in the Aspen countryside for movers and shakers in politics, entertainment, and industry. This allows for plenty of fun as Selina talks her way into and out of Wade’s good graces, but the structure of the weekend leaves most of Selina’s team with little to do. Dan contemplates settling down before reverting to type, prompting Amy to decide to get an abortion, and Ben and Kent wittily react to everything happening around them. That’s about it. This ensemble can make a lot out of not much to do, but after such an impressive premiere, “Discovery Weekend” underwhelms. Instead of its ensemble, the episode focuses on a handful of guest stars. Hugh Laurie delivers in the much-anticipated return of Senator Tom James, and Rhea Seehorn is terrific as Tom’s deputy campaign manager Michelle York. The real star of the episode, though, is William Fichtner as Felix Wade. His fickle, controlling former music mogul makes Selina dance for his endorsement, literally, before switching to Tom and then ultimately backing Senator Kemi Talbot (Toks Olagundoye). Fichtner floats through his scenes, his physicality setting him apart from the rest of the cast. Felix’s casual disdain and nonchalance is a nice change of pace from the usual Veep power players and his particular flavor of petulance is incredibly entertaining. Though he makes the biggest impact, Felix is deployed sparingly. The bulk of the episode centers on Selina and Tom’s reunion and political sparring. Tom surprises Selina right before she’s about to speak to the Discovery Weekend attendees and declares his love for her. This throws her off her game and she bombs her speech, losing Felix’s support, but it’s unclear whether that was Tom’s sole intent, or merely a happy outcome. The episode refuses to come down on one side or another, giving the pair a warm, romantic moment later on where they reminisce over health scares and what could have been. It’s a lovely scene, albeit one that feels lifted from a different show. 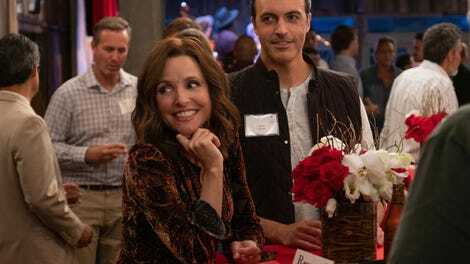 Julia Louis-Dreyfus and Laurie are great together and it’s always appreciated when Louis-Dreyfus and the writers explore different sides to Selina’s personality. However, there are only seven episodes this season and the Selina-Tom tryst teased here gets a lot of time considering the late-episode reveal that Tom is also involved with Michelle, not to mention his off-screen wife. Though the ensemble banter and laugh-a-minute pacing of the premiere are missing here, a few of the supporting characters have standout moments. Gary is a treat as always, cackling along with Selina, and Tony Hale’s knowing look as Amy runs into the bathroom is delicious. 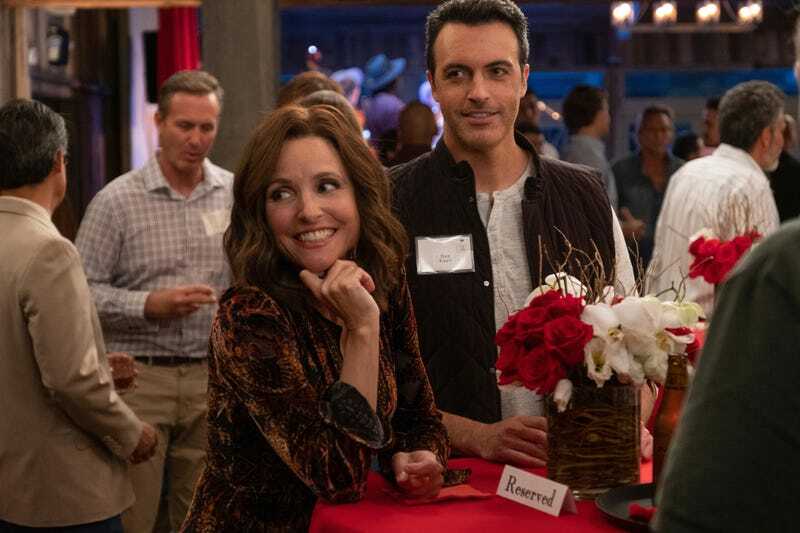 Gary Cole’s trademark dry delivery as Kent ponders whether Dan is Felix’s type is a lot of fun, and Reid Scott’s shocked, almost traumatized reaction when Dan gets shot down is pitch perfect. It takes Dan finding a Meegan to hook up with for Amy to give up on him changing in any meaningful way, but she gets there and Anna Chlumsky’s delivery as Amy schedules her abortion and asks about a flu shot is satisfyingly confident. Even less successful is the episode’s callback to Teddy’s chemical castration. Surprised during an interview with a question around inappropriate sexual conduct, Teddy advises Jonah to claim he was chemically castrated, which Jonah breezily goes along with, missing the ominous subtext to Teddy’s assertion that no one follows up on such claims. The exchange is awkward and completely inorganic. Not only would Jonah never agree to say he’d been chemically castrated, such a claim would raise the scandal’s profile instead of making it go away. The line only exists to remind the audience of Teddy and Jonah’s history and to set up an eventual late-season payoff. It’s disappointing; Veep usually has much tighter writing than this. It may not have the propulsion and excitement of “Iowa,” but as a table-setter, “Discovery Weekend” works. Selina’s main competition in the primary has been introduced, emotional stakes have been established for several characters, and threads like the US Attorney’s grand jury into the Meyer Fund have been seeded. With the campaigns picking up steam, and only five episodes remaining, here’s hoping the next episode returns to the breathless pace and energy of the premiere. The costuming department kills it again this episode with Mike’s ridiculous Western getup. Matt Walsh has made Mike such a specific character. Of course he’d wear an outfit like that, and be bested by a sprinkle dispenser. Selina’s most memorable moments this episode are charged, both her exchange with Tom and her brilliant dismissal of Michelle, but she’s also hilarious reacting to Amy’s pregnancy. It’s a quick exchange, but Louis-Dreyfus, Hale, and Chlumsky nail it. Speaking of nailing it, Emily Pendergast has been a wonderful addition to the ensemble as Jonah’s wife (and ex-step-sister) Beth.